Awesome elementary assembly programs for your school! The children really related to the bullying messages. Some of them have told me that the show will help them speak up and help other children. We all learned a lot of lessons, and loved your anti-bullying assembly program! In this anti-bullying school assembly program, James stresses the difference between direct bullying (such as threatening or hitting), and indirect bullying (such as spreading rumors), and lets students know that indirect bullying is just as serious. Students are encouraged to tell the teacher or principal about bullying situations, and are taught that “telling” is not the same as “tattling” when it comes to something as serious as bullying. They also learn that excluding a student is a form of bullying, and that our goal is to be a community that includes rather than excludes. As in all James’ school assembly programs, the anti-bullying assembly uses magic illusions and lots of humor and audience participation to illustrate these and other points. The character education assembly program stresses the values of respect for self and others, honesty, and responsibility. K’s through 3rd graders will learn to avoid dishonesty by seeing Pinocchio’s nose grow! In another routine, the magician messes up a trick, and the kids have to bail him out, teaching the virtue of taking responsibility for one’s mistakes. Older children (usually 4th through 6th) find out that they cannot lie to Sherlock Holmes. 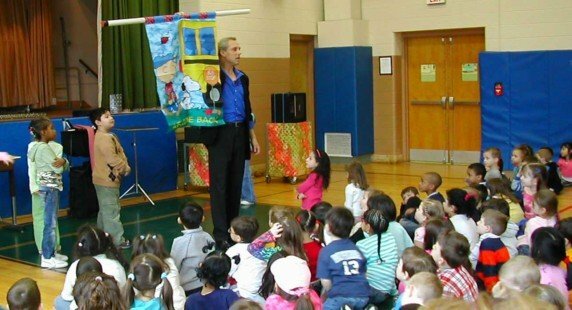 These assemblies teach important values in entertaining and memorable ways, appropriately customized for both younger and older children. Smoking is BAD for you! That’s the basic message… but wait, there’s more. Smoking destroys your health and consumes your money. It gives you bad breath, yellow teeth, stinky clothing, and is definitely NOT COOL! Smoking is an ADDICTION, and James has several fun and unique ways to explain the meaning of addiction to children. All these anti-smoking messages are communicated using audience participation (and there is never any lack of child volunteers! ), and exciting, fun, and amazing MAGIC! 5th and 6th graders, if addressed separately, can also benefit from a version of James’ middle school anti-smoking assembly, in which James exposes the tricks of tobacco advertisers who attempt to manipulate their fears and desires. Get your students excited to read! Using magic and illusion, James turns kids on to the adventure of reading, introducing them to classics in many genres, and letting them know that between the covers there is pure magic to be found! Libraries click here!! This fun and exciting, magical anti-drug school assembly program communicates powerful messages that children can understand. For the very little children the messages are simple: drugs are BAD for you, drugs destroy your body and your mind, and drugs cause ADDICTION (which James explains with a fun magic routine so that even the youngest children can understand the meaning and dangers of addiction). This assembly may be combined with the anti-smoking school assembly, with James covering both smoking and drugs in the same show. Rewards Assembly… Just for Fun! Want to reward your students for their fundraising efforts, or their good grades and attendance? James’ fun magic show is a great way. No message, just lots of audience participation and fun! “MagicCadabra! is a show that the whole family will enjoy! Your parent-teacher organization can book either the one-man comedy magic show, or the 2-person show that includes spectacular vocalist Sally Ramirez. Elementary School Magic Assembly Reviews! Read what dozens of teachers, administrators, counselors, and parents have to say about James’ anti-bullying assembly (and others) for elementary school students. The students enjoyed everything and I did as well! We loved how you tied in important messages about bullying, and kept the students engaged. Thanks again for a great assembly! The way you wove the message together with the magic was fabulous. I’ve already gotten raves from our 3rd, 4th and 5th graders, and teachers. One teacher said, “Did you tell him what to say?” She said that because your message was so relevant to our school bullying policies. Great assembly! James did a wonderful job! The program blended magic with an anti-bullying message that was loud and clear. We had two programs, and the K-3 was approached in a way that was very age appropriate. He did a different show, again age appropriate, for our older students. The kids (and adults) laughed and had a great time. I would recommend James without hesitation. I’ve been getting great feedback already from teachers and children. They loved the assembly! Thank you James for a great show! The kids are still talking about the performance. We appreciate how you made the trip here for us! Thank you so much for your program today! The students really enjoyed themselves. And more importantly, they heard an important message that we tell them all the time, now reinforced through your show! I’ve been booking assemblies for our schools for 13 years, and your show was great. I invited some parents to the assembly since the PTO paid for this, and they loved the show too. Teachers and students were coming up to me after you left telling me how fabulous the assembly was. Thanks! That was a great assembly. It’s just what our students needed to hear. Thanks so much for coming to Sporting Hill and tailoring your message to connect with our Schoolwide Positive Behavior program. Your message was impacting and well received. We would love to work with you again sometime in the future. Great assemblies, James, thanks for coming. The kids loved it, and the message was excellent. Thank you again for coming to our school and sharing your talents with us! Lots of great comments on the show. You told them exactly what we wanted to communicate about character education. We have had several bullying assemblies over the years, but yours was the BEST anti-bullying assembly we’ve ever had. And your programs were perfectly tailored to the different age groups. We’ll spread the news to the other schools in our parish. That was phenomenal! The message was just what we wanted to teach our kids about bullying. James, we got good feedback from the students. They enjoyed the performance and understood the anti-bullying message. Thank you for the great performance! The show was awesome! Thanks so much for coming to our school. The kids are still talking about it! I had multiple teachers tell me that they liked how you incorporated the message throughout the show and tied it in with the magic. You gave the kids a visual to help them remember the very important points about feelings, inclusion, and helping one another with bullying. It wasn’t just some random tricks and a few points dropped here and there. And the kids don’t only talk about the magic — they bring up the points you made and explained. They got a lot out of it. I was at your assembly at Center Street Elementary this morning, and just wanted to let you know how much I enjoyed it. And obviously the kids did too. I’m not sure there’s any better sound than a room full of kids laughing. And your message was awesome! Community Information Specialist , Horseheads Central School Dist. You were fantastic! Our grandparents had wonderful things to say about your performance, and our kids were talking about your magic all day. The feedback was great: all positive! Our teachers were thankful for your message, and the students were excited about your engaging presentation! That was a wonderful assembly, with a great message. It was nice to see EVERYONE (students and teachers) smiling and enjoying the message/show! Terrific show! That’s just what we want to tell our students about bullying. Thank you for your wonderful performances yesterday. The teachers, staff, principal, and most importantly, the students, all raved about the shows! Although fun tricks and illusions were used, Mr. Warren’s anti-bullying message was clear and easy for the students to understand. Students were totally engaged and captivated by his humor and audience participation. It was an awesome performance! Your character education assembly was perfect. Please email me the list of points you made about gaining self-respect and dealing with feelings, so that we can incorporate them into our ongoing work with the children. Watch what parents, educators, and counselors are saying about James Warren’s Magic With A Message school assembly programs. I’ve been doing this for 35 years, and I was impressed by your assembly! That was awesome! You had those kids riveted. We’re definitely having you back! Great assembly! The real magic of that show was that the two students you picked to help you on stage were the two most bullied students at our school. I was on the phone with both their parents just the other day! I’m sure they benefitted greatly from your bullying assembly, as did all the other kids. Thanks. The students were spellbound as you masterfully wove illusions with an important lesson on self esteem and saying “No” to drugs. We are appreciative of your work in making the future successful for young boys and girls! I was very impressed. The kids were truly amazed. James wove the magic and the message incredibly well. Thanks for coming to our school! I got so much good feedback from students and staff. Your character education assembly program for our elementary students was wonderful! We enjoyed the show very much. The students were talking about it a lot! Thanks for coming to our school. We got GREAT feedback. Everyone LOVED you! You do an amazing job! Thanks tons! The kids love it! The Rewards Assembly was the perfect way to celebrate students’ positive behavior this month. Mount Wolf students are in “Awwwwe” of James Warren! I really enjoyed your technique of captivating the students with magic and then delivering the no-smoking message through advertisements. Thank you James for participating in a very successful National Day Out for our summer campers! I would like to thank you again for coming to our school and performing amazing magical messages. The teachers and children are still talking about it. I will be sending you a CD with some pictures from your performance. This is truly a blessing. Thank you again. In planning this program, I was afraid the magic wouldn’t match with the anti-bullying message we’re trying to communicate to our students – but you covered everything we wanted to say, and did it in a way the students loved! Thanks for being so kind & easy to work with. So far so good. Much feedback from parents & kids: the magic got through & so did the message. Thank you for the wonderful assemblies you gave to our school. All of the evaluations from the teachers and students were good/excellent. Even my 5th grade son really enjoyed the show and he can sometimes be a tough audience! Thanks again for a great message for our kids. Our students were enthralled with you from the moment you began. Your comments were very age appropriate and changed thoughtfully as the age of the groups changed. The feedback I received from the parents, students and staff were tremendous. The most enjoyable program of the year. Please feel free to have others call me should you need any references. It was amazing how you kept the attention of our students. Our students are not easy to captivate, but they really loved your show, and they listened to the message. I heard nothing but glowing reports from the teachers, staff and students. Thanks for coming to our school, James! I had the privilege of viewing your show at Shade Gap Elementary and was certainly impressed with the way you related to the students. In fact, you had the riveted attention of each student . . . I appreciated the way you involved the students. Based upon the performance I saw, I would be happy to recommend you to any of the schools in our area. Thank you for coming back to your alma mater and delivering an important message in such a wonderful way! Great assembly, James, and the program content was excellent. The messages you gave them about bullying were exactly what we try to tell them at school. Well done! We received very positive feedback from the teachers and students regarding your “Magic With A Message” assembly. Your magic, comical dialogue, and anti-drug message were melded together seamlessly. We would recommend you to any elementary school interested in assemblies that promote postiive self-esteem and staying away from drugs.